Blame shocolate: it's all her fault!! And now I'm posting them here cos I thought you, my dear flist, might enjoy them too! ...and now it's off to bed for me.... NO! I will NOT look at more SW/HP for more manip possibilities! Must go to bed. Now. That is awesome! Emma looks great in that hair! *le sigh* My favorite Trios. I love your SW art. It's gorgeous. Particularly the works of Han and Leia. 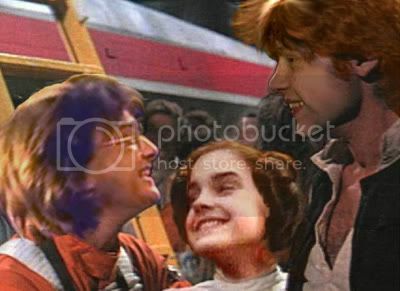 its perfect that leia and luke are twins...yay r/h and h/l!!! lol! those are really good. would you mind if i friended you? i'm a big h/g shipper, and i found you through one of my friend's friend lists.